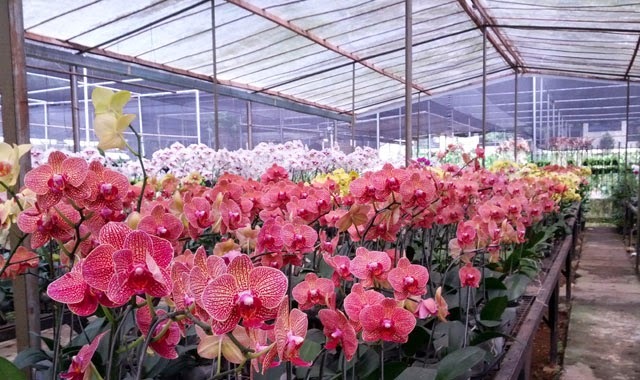 An interesting place to visit with family and on the other hand also be able to provide lessons for children as well as your own relatives or who want to better understand how to cultivate crops Orchids. To get the orchid village track orchid at kelud would fit into the mountain, and there is a signpost that reads his "hometown orchid " to the south 3 km and when to mount Kelud on the left while the village if you want to turn right orchid. The range of twenty meters to the right after entering the street next be seen only of rice fields and vacant land full of trees and bushes. Jai if you are a first come here do not be afraid wrong path because the path to the village orchids are a little trekking. After passing through the track, there are more new instructions, it has many instructions. The instructions in the form of an arrow to the left with the inscription Kampung Anggrek. Approximately two hundred limu dozen meters from the arrow, you will reach the village of orchids. It is located in the Village District Ngancar Sempu Kediri. Although still relatively new, but the place is quite neat. There is a play area that shade. Ample parking . And along the walkway many flowers colorful bloom. To enter without a ticket, just pay only for park, usually when you come here on weekend there will be enough really crowded with small children to school over there on holiday n ama teachers and parents together with relative. There also green house and will pass through the park along the left and right there are the flowers look such as dahlias, sun flowers and many more. Here visitors can enjoy the beauty of flowers other than orchids of various kinds can afford it, there is a name and price. orchids here there are three green house orchid to orchid ready for sale and an orchid house for the nursery to be build soon. Here not only sell orchids, there are other flowers such as shoes and other beautiful flowers.